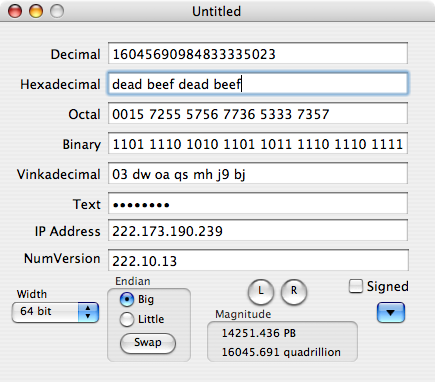 BaseMaster is a Mac OS X application that shows several bases of a number simultaneously. It shows 8 edit fields representing decimal, binary, hexadecimal, octal, vinkadecimal, IP address, 4 character long, and NumVersion. As you type in any of these fields, all the other fields are updated. BaseMaster will also let you do common geeky-math operations on your numbers. Geeky math is things like AND, OR, and XOR. It also does the common arithmentic operations.